Chris Green is all business in the corner of his boxers. They put together a secret code, instead of the numbers system for punches. “I need that Larry Holmes”, which one has to imagine has to do with the jab. Green is the type of trainer who ALWAYS has his fighters 100% in shape and ready to go. None of his fighters missed weight, he keeps them in check on every aspect from conditioning to diet. Green went 5-0, 4KOs in 2015 as Kirstie Simmons was 2-0, 1KO and Donald Cobb was 3-0, 3KOs. As a matter of fact, Green’s last loss in a corner came in 2012, impressive. Green is quietly putting together a great team fighting out of Glenn Goodson’s A-1 Boxing Gym in Aurora which includes manager Alan White. White has one of the strongest stables of fighters in Colorado which includes Simmons, Cobb and Manuel Lopez. Every good trainer has a ‘right hand man’ and Green’s is Rob Fierro, takes a full team. Chris Green is the RMB Coach of the Year. CONGRATULATIONS TO PEYTON MANNING UPON HIS RETIREMENT FROM FOOTBALL! 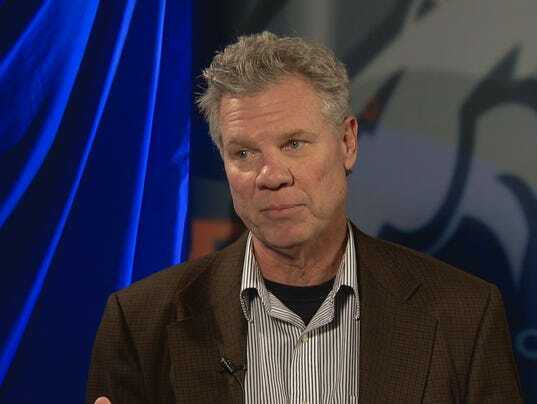 KUSA - 9NEWS is excited to announce that Mike Klis will be joining the 9NEWS Sports Team effective immediately. His first day at the station will be April 27. Klis is a longtime Colorado sportswriter with more than a decade of dedicated coverage of the Denver Broncos. Klis also covered the Colorado Rockies for 13 years. Klis has been recognized with numerous Associated Press Sports Editors awards, including a First Place Award for Breaking News. He's a two-time recipient of the Colorado Sportswriter of the Year award from the National Sportscasters and Sportswriters Association. In addition to sports writing, Klis has appeared on many national televised sports programs: ESPN, Fox Sports Network and the NFL Network. Klis will be joining the Broncos-coverage team of Drew Soicher, Rod Mackey, and Aaron Matas. 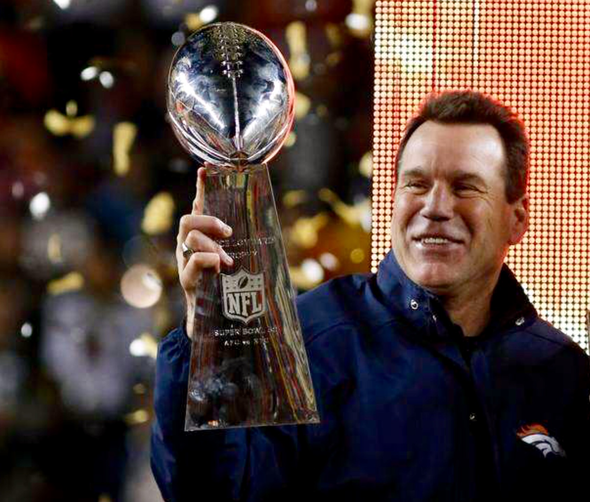 Pro Players Association WELCOMES Coach Gary "Koobs" Kubiak back to Denver! CONGRATULATIONS TO THE RING OF FAME INDUCTEES MINGO, UPCHURCH AND REEVES! 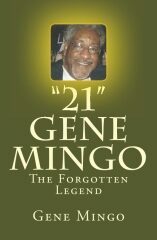 GENE MINGO INDUCTED INTO BRONCOS RING OF FAME! CONGRATULATIONS to our great friend and Pro Players Association member Eugene Mingo on his induction into the Denver Broncos Ring of Fame!!! Your time has arrived! Just spoke to him and congratulated him personally! He is so very happy and honored! You did it!! The wait is over! Yeah! The NOT forgotten Legend! Gene announced the second round draft pick for the Denver Broncos live from Radio City Music Hall, NYC during the NFL draft! How awesome was that!!! The Pro Players Association would like to extend our sincere condolences to the Lynch family and to the Denver Broncos family. Longtime Bronco Fran Lynch passed away at the age of 68. Former Broncos running back Fran Lynch has passed away. Born December 3, 1945, in Bridgeport, Conn., Lynch made his way to the AFL and NFL after playing for Hofstra. He was 68. Lynch spent his whole career in Denver, from 1967 to 1975, racking up 1,258 total yards on the ground and 357 yards in the air. Drafted in the fifth round at 110th overall in the 1967 NFL Draft, Lynch would go on to play in 99 games with 15 starts. A reserve halfback behind Floyd Little, Lynch scored 12 rushing touchdowns with a 4.1 yard average per carry and two receiving touchdowns. He could also be dangerous in the passing game, averaging 10.2 yards per catch on 35 career receptions. A steady figure for the Broncos, Lynch's versatility also carried over to special teams, where he averaged 23.2 yards on five kick returns. *A personal note about Fran Lynch. On the evening of Monday, September 10, 2001 Gary Adler spent several hours sharing conversation and a few beers with Fran Lynch and his son at Ron Egloff's 'Jackson's' at 6th and Kipling. Fran had just come from the Denver Broncos grand opening game at the new Invesco Field at Mile High. Discussion was mostly surrounding Ed McCaffrey's injury that evening. Who would have known that that very next morning everything as we knew it would change forever. Rest in Peace Fran Lynch. September 8, 2014 at the age of 76. Condolences to the Gonsoulin family and the Denver Broncos family from the Pro Players Association. Born in Port Arthur, Texas (home of Janis Joplin), Gonsoulin starred at Baylor where he was team captain and played RB, WR, and Safety. 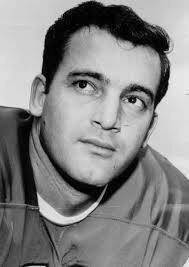 He joined the Denver Broncos in 1960 during the inaugural season of the AFL. Gonsoulin was the consummate Pro Bowl safety. He was named All-AFL four times and played in the Pro-Bowl six times. He still holds Denver's record for the most interceptions in a season (11) and is tied for the single game record (4). He held the career interception record (43) until 1987, when Steve Foley broke it with 44. Gonsoulin was chosen as one of four charter members to Denver's Ring of Fame in 1984 along with Floyd Little, Rich Jackson and Lionel Taylor. 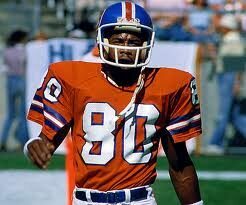 He was also picked for the Broncos' 20 year All-Star team and was named to the Colorado Hall of Fame in 1984. Wednesday, July 23, 2014 - 2:00 a.m.
Pat Bowlen, one of the most iconic owners in NFL history who helped guide the Broncos to six Super Bowl appearances and two world championships in his 30 years as owner, is relinquishing control of the team as he acknowledges he is dealing with Alzheimer's disease. Team president Joe Ellis will assume control of the Broncos as Bowlen focuses on his health. "It's a really, really sad day," Ellis said. "It's sad for his family, his wife and his seven children. It's sad for everyone in the organization. And it's sad for all the Bronco fans who know what Pat Bowlen meant to them as an owner. It's a day nobody wanted to see happen." Bowlen, 70, has placed his Broncos' ownership in the Pat Bowlen Trust that is controlled by non-family members. Final-say authority with the team is held by Ellis. Bowlen's long-term goal is for one of his seven children to run the team when they're ready. To be clear, the Broncos will not be put up for sale. A statement by the Broncos to The Denver Post said the trust was set up by Bowlen more than a decade ago as part of his long-stated desire to keep team ownership in his family. 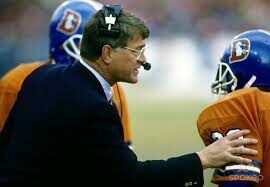 Bowlen had first revealed to The Denver Post in May 2009 that he was experiencing short-term memory loss. Bowlen, his family and the team on Tuesday acknowledged for the first time that his condition had developed into Alzheimer's, a brain condition that worsens as it progresses and currently has no cure. "Pat has always wanted the focus to be solely on the Denver Broncos and the great fans who have supported this team with such passion during his 30 years as owner. My family is deeply saddened that Pat's health no longer allows him to oversee the Broncos, which has led to this public acknowledgment of such a personal health condition." According to the Alzheimer's Association, more than 5 million Americans are living with the disease and it is the sixth-leading cause of death. Bowlen lost his mother, Arvella, after a lengthy battle with Alzheimer's, in 2006. 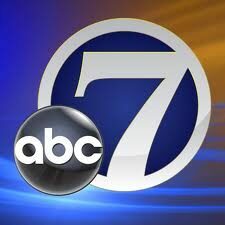 Mr. B's leadership"This is a sad day for the NFL," commissioner Roger Goodell said in a statement to The Denver Post. "Pat Bowlen's leadership has been critical to the success of the Broncos and the entire NFL. From building a championship team that is a pillar of the community to his important work for the league on television and labor matters, Pat's love of the game drove him and we have all benefited from his passion and wisdom. But the time has come for Pat to focus on his health and we fully support him. Joe Ellis has been a trusted executive for Pat for many years after working with us at the league office. Joe's deep experience ensures that the Broncos will continue to have strong leadership." Although the revelation of Bowlen's condition is an emotional blow to the Broncos' franchise, business in many respects will continue as usual. 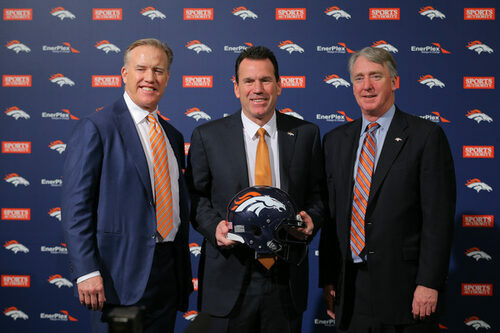 Bowlen already had removed himself from the team's day-to-day operations in 2011 after he promoted Ellis, his longtime right-hand man, to president. 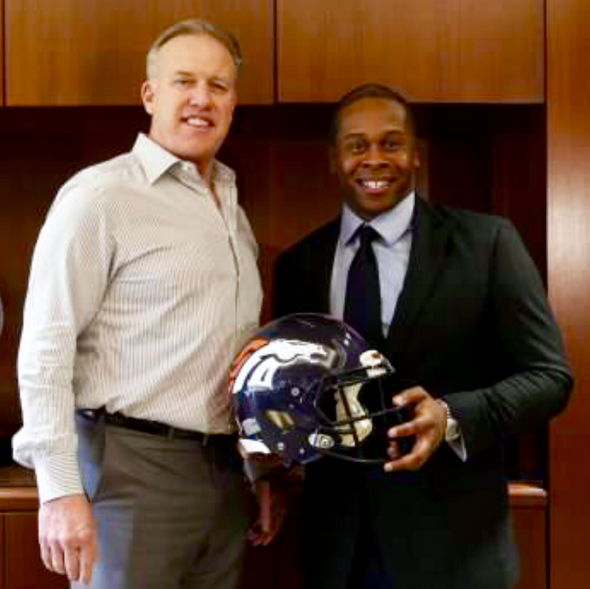 One of Bowlen's most significant decisions before stepping back was working alongside Ellis in reshaping the Broncos' football operations department in 2011. Together, Bowlen and Ellis hired legendary quarterback John Elway to run the football operations department. Elway then hired John Fox to succeed Josh McDaniels as coach. With Ellis overseeing the club's day-to-day operations and Elway running the football department, the Broncos have won three AFC West Division titles and reached no less than the Elite Eight of the NFL playoffs in each of their three seasons. After signing free-agent Peyton Manning in 2012 to become their quarterback, the Broncos have gone 13-3 in each of their past two seasons and last season won two AFC home playoff games at Sports Authority Field at Mile High to reach their seventh Super Bowl, sixth under Bowlen. To be sure, the past three seasons have been a remarkable rebound from the low point in the Bowlen era, which was a 4-12 season in 2010. "No one fills Pat Bowlen's shoes," Ellis said. "Everybody in this organization — John Elway, John Fox, the players, all the Broncos' employees, we understand what Mr. Bowlen's goals and objectives are and it's our obligation to fulfill them. "Not only is he firm in his commitment to winning, he also wants to make sure people in his organization do things the right way, and sometimes that's not always the case. But when he saw mistakes, even if they were his own, he recognized them and corrected them quickly. That's the standard he set. It was clearly defined. It's easy to see and it's so easy for all of us to follow. That's what we're going to do in the future." For the better part of three decades at Broncos' headquarters, Bowlen was affectionately known by his players, executives and employees as "Mr. B." He was the type of owner who struck that delicate balance between being in the office every day and making the tough decisions when he had to, but also letting the people he hired do their jobs. By any measure, Bowlen has been one of the most successful owners in all of sports. Bowlen was 40 in 1984 when he and his siblings bought the Broncos from Edgar Kaiser for $78 million. Forbes recently listed the Broncos' value at $1.16 billion, although that might now be a low estimate considering the NBA's Los Angeles Clippers were recently tentatively sold for $2 billion. Last year, Bowlen became the first NFL owner to reach 300 career victories by his 30th season. The Broncos won the AFC championship in the 1986, '87 and '89 seasons with Dan Reeves as coach, 1997 and '98 seasons under Mike Shanahan, and the 2013 season with Fox as coach. 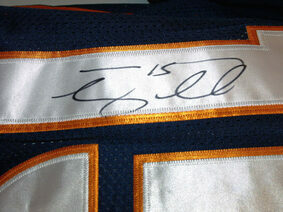 They won back-to-back Super Bowls with Elway at quarterback in 1997 and 1998. Perhaps the most astonishing feat during the Bowlen era is that the Broncos had only five losing seasons during his 30 years. Compare that to the Detroit Lions, who have posted losing records in 12 of their past 13 seasons, or the Oakland Raiders, who have nine losing seasons and two 8-8 records in their past 11. "The reason Mr. B has been so successful is he put all his resources, his passion, his energy into winning," Ellis said. "He's a modest, kind, humble guy but you will not meet a more competitive man." Although he was born in Wisconsin and attended college at the University of Oklahoma, Bowlen had roots in Canada, and it took a while for the Denver region to warm up to the outsider. Shy by nature, Bowlen was initially perceived as aloof by the Denver region and his image wasn't helped when he was seen wearing a fur coat on the sidelines early in his ownership tenure. But Bowlen put away the fur coat after "The Drive" game in Cleveland in January 1987 and in time became one of the NFL's most respected and beloved owners. And productive. Besides his work with the Broncos, Bowlen was co-chairman of the NFL's labor committee for 10 years and also chaired the broadcasting and NFL Network committees. In the NFL fiscal year from April 1, 2013, to March 31, 2014, the 32 NFL teams split $6 billion in national revenue largely built on network TV contracts. His work largely done, Bowlen had not been active on the league committees in recent years and it was Ellis who represented the Broncos at the 2014 owners meetings in March. Ellis, 56, worked three years with the Broncos from 1983-85, spent nine years in the NFL office, where he worked alongside Roger Goodell, now commissioner, among others, then returned to Denver, where he has spent the past 17 years with the Broncos. Going forward, Ellis will add Broncos CEO — which had been Bowlen's role since he purchased the team in March 1984 - to his title as team president. Ellis and Elway will continue to head the franchise in 2014, but Bowlen told The Denver Post in his last wide-ranging public interview, in August: "If something were to happen to me, I've already made this clear, this team is going to stay in the Bowlen family no matter what. It's a great asset. And it's a lot of fun if you do it right." Bowlen has five children with his wife Annabel — Patrick, John, Brittany, Annabel and Christianna. Patrick and John are Broncos employees, and Brittany works in the league office. Bowlen also has two children — Beth, who also works for the team, and Amie — from a previous marriage. "Now is not the time to talk about the kids individually or collectively," Ellis said. "This is really hard for them. It's a very difficult time for Annabel and the children. They've been given an overview of the future, but their focus is on their father's health and care. They have great sadness that he won't be around to do what he did so well for 30 years. Out of respect for those kids and Annabel, now is not the time to speculate what the future holds." Challenging as the Broncos' ownership situation might appear, it is not unprecedented. San Diego Chargers owner Alex Spanos announced in 2008 that he was suffering from a severe form of dementia. The team has long been run by his son Dean, who serves as Chargers' president and CEO. Bowlen long ago got his affairs in order so the Broncos could carry on. "The future is in good shape," Ellis said. "We have great people working in the football area. We have great people working in the business area. They're committed to our fans, the mission that Pat Bowlen has put in front of us. We want to carry that out on his behalf and on behalf of the fans. Ryan Spilborghs is returning to the Rockies. Not as a player but as a TV broadcaster. A fan favorite and key member of the 2007 World Series team, Spilborghs will join Root Sports as part of the Rockies' pregame and postgame shows. "It was an obvious next step in my career," Spilborghs wrote, in part, on a blog for denverpost.com explaining his decision to retire. "It's funny when you do things ... you get presented with more opportunities, and it feels right pursuing them." Root Sports is expected to announce its full baseball talent lineup at a later date. The decision wasn't easy for Spilborghs. He considered resuming his career with the Rockies on a minor-league contract, but he couldn't pass up this opportunity. He played last year for Japan's Seibu Lions, chronicling his experience for The Denver Post in a series of popular blogs. Spilborghs, 34, has a variety of media experience, including appearing in car commercials and hosting "Spillin' The Beans," a comedy short for the Rockies' website. 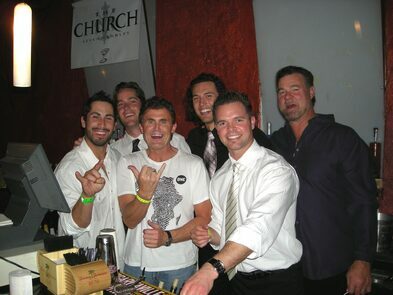 Ryan Spilborghs (pictured on left) was a Pro Players Association Celebrity Bartender. Spilborghs played seven seasons with the Rockies, last in 2011, hitting .272 with a .345 on-base percentage, 42 home runs and 218 RBIs. "We are very pleased to announce the addition of 'Spilly' to our Root Sports telecasts," said Root Sports general manager David Woodman. "His background as a player, as well as his charismatic personality, add a new energy and insider focus to our Colorado Rockies broadcasts." March 20, 2013 -- "Stuff That Truck" Hurricane Sandy Relief Effort received a generous contribution of NEW Clothing and Accessories from Current Factory Outlet, 1025 E Woodmen Rd, Colorado Springs, CO. Many thanks to Judy Marciw, Factory Outlet Manager, for her interest and assistance in acquiring the contribution for our Disaster Relief Effort. The merchandise will be trucked by Exodus Moving & Storage of Denver to the Salvation Army Disaster Distribution Facility in NJ and distributed to those victims most in-need. PPA's CEO Gary R. Adler was appointed to the Salvation Army's Advisory Council at a luncheon in Denver on Thursday, September 27, 2012. He is honored to have been appointed and is looking forward to working with many distinguished community leaders on the board. Gary will be providing his event and fundraising expertise to aid in generating much needed funding for their many extraordinary community projects. PPA Executive Board member Kurt Hansen and PPA member Fred Gayles, Jr. were also appointed to the Advisory Council as part of Pro Players Association's affiliation with the Salvation Army. Thanks to Commander Ron McKinney and Major Erik Hoogstad for your confidence in Pro Players Association. Pro Players Association has been a long-time supporter and affiliate of the Salvation Army and looks forward to continuing their strong-standing relationship. We are proud to announce that our organization has earned the GuideStar Exchange Seal, demonstrating our commitment to transparency. GuideStar USA, Inc. (formally known as Philanthropic Research, Inc.) is a 501(c)(3) public charity founded in 1994. 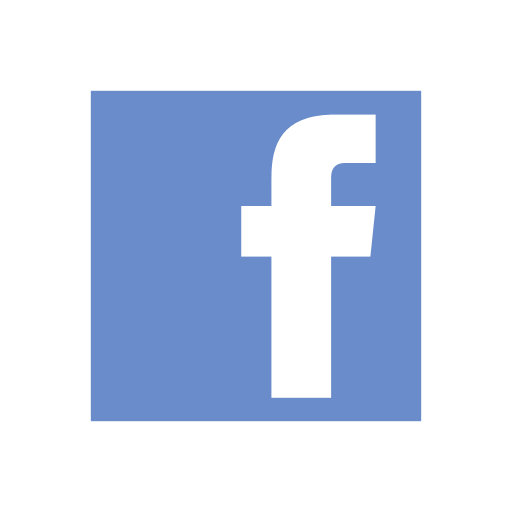 GuideStar USA, Inc.’s mission is to revolutionize philanthropy and nonprofit practice by providing information that advances transparency, enables users to make better decisions, and encourages charitable giving. The GuideStar Exchange is an initiative designed to connect nonprofits with current and potential supporters. With millions of people coming to GuideStar to learn more about nonprofit organizations, the GuideStar Exchange allows nonprofits to share a wealth of up-to-date information with GuideStar's vast on-line audience of grantmakers and individual donors. Exchange members are nonprofits that have updated their nonprofit reports to the fullest—sharing information, documentation, photos, and video with GuideStar's visitors. FINALLY! 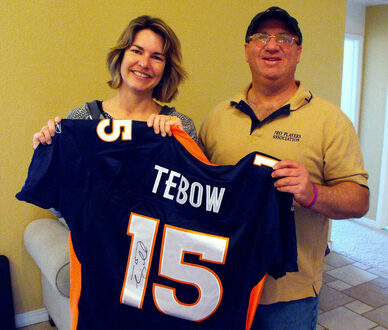 Presentation was made Saturday, April 14 of the Tebow autographed jersey which we donated for the Palmer Reorda Family Leukemia fundraising efforts. 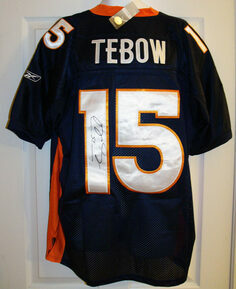 The jersey went to a high bidder of an auction benefiting Palmer's treatment. A local Colorado Springs woman who donated $1000, Melissa Devolve accepts the jersey from Pro Players Association CEO Gary R. Adler photographed by Lindsey Harrison of the New Falcon Herald. 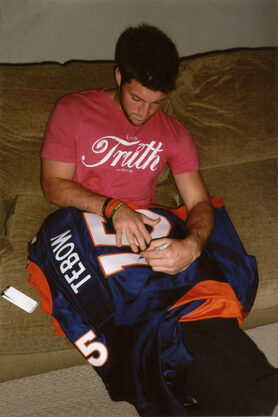 Special arrangements were negotiated by Pro Players Association and Palm Springs Autographs, Tebow's agent, to arrange for the jersey to be autographed by Tim. Pro Players Association has announced it plans to launch a professional management, production and promotions division after many requests for the services have been received over the last several years. CEO Gary R. Adler recently met with several key individuals in the sports, arts and entertainment and media industries to discuss the prospects for the division. After review of the current and future outlook of the industries, it was decided to move forward with the planned extension. Requests for a professional speaker's bureau to be organized and presented by PPA have come from several professional and motivational speakers around the country. Several venues around Colorado and in other states have requested PPA organize and present festivals and concerts in their facilities. Additionally, many celebrities have requested business management representation from PPA for promotions and booking. Dan Stewart, member of PPA's Executive Board, will be assisting in implementing the division. Implementation of the division will become a reality in mid to late Spring 2013. Stay tuned for more information. DENVER - Professional athletes showed their patriotism Monday morning in an attention-getting way. Former sports athletes were out bright and early to celebrate America's Independence Day by waving flags at the Union Avenue bridge over Interstate 25. They caught the attention of drivers passing by with their patriotic display. Former Nuggets player and now sports radio commentator Scott Hastings showed up along with MLB Hall of Famer Bob McCaslin and others. This group of people - called the Flag Guys - gathers every major American holiday. The group was started by Denver resident Chris Tucker. Tucker works with the Professional Arena Soccer League. He gathers fellow athletes to show off their stars and stripes. The written article above was changed deleting the following two sentences (in parenthesis) which appeared on the 9NEWS web site, as we are not the Pro Players Foundation and we were not promoting anything. The article originally read ("They were promoting the Pro Players Foundation. The non-profit organization is a group of professional athletes and community members that supports children.") We were just gathered to show our patriotism, nothing else. This inaccurate information was fabricated to bolster the news article by a 9NEWS staff writer. It was deleted from the article on Tuesday morning, but could not be edited from the video. The following text still appears in the video shown below. Internationally renowned artist Malcolm Farley, is well known for his unique ability to capture the moment, the action, and the spirit of “The Game”. In his distinctive painting style, Malcolm blends bold strokes and vibrant colors to capture the drama of the world’s most memorable moments. Now, within just a few days of the New York Giants come from behind victory over the New England Patriots in Super Bowl XLVI, Farley unveiled his most recent Super Bowl masterpiece. For the eighth consecutive year he is releasing a limited edition, hand embellished, series of canvases co-signed by the winning quarterback and himself. This colorful rendition of Eli Manning masterfully directing the Giants march down field against the majestic backdrop of Lucas Oil Stadium and the Indianapolis skyline, has elegantly captured “America’s Biggest Show”. Malcolm has long been associated with the National Football League and the Super Bowl scene for the last two decades. 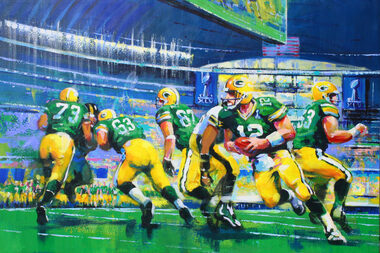 His paintings of the games, along with images of some of the all time greats, are annually reproduced as limited edition canvases, and are immediate sellouts. He was commissioned to create a commemorative series for Pepsi, highlighting Super Bowl games from the past, that adorned one billion cans in what is considered the most successful soft drink promotions in history. 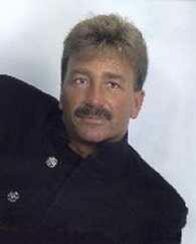 His has been the artist of choice for Hall of Fame Inductions, the NFL’s annual Kickoff Game, as well as a variety of Pre Super Bowl and Players events where he has entertained Corporate America. Click here to view this Super Bowl XLVI Masterwork, available for purchase in two versions, 1) signed by both NY Giants Quarterback Eli Manning and Artist Malcolm Farley; 2) signed by the Artist Malcolm Farley only. PPA makes headlines once again! Acting on behalf of an organization planning a benefit to raise money for the families of active military personnel, the ACLU of Colorado today challenged the Town of Parker’s ban on the display of banners and American flags during the special event planned for June 4 at a privately owned restaurant in Parker. Gary Adler, President and CEO of the Pro Players Association, asked for the ACLU’s assistance after Parker officials insisted that his application for a permit depended on his agreement to comply with the Town’s conditions. He was told that flags and banners are forbidden. According to Adler, at a public hearing held to consider his fundraiser, the City Attorney confirmed that even a display of the American flag was forbidden under the Town’s rules. In a letter sent to the Parker Town Attorney today, the ACLU explained that the City’s effort to enforce a “no flags” and “no banners” rule violates the sponsor’s First Amendment rights. The ACLU’s letter asks that the Town Attorney issue the requested permit and immediately withdraw any threat to enforce the “no flags” and “no banners” rule during the Celebrity Bartender Night planned for June 4 at Joe’s Crab Shack in Parker. CASTLE ROCK, Colo. -- A Castle Rock man has been warned that reusing a United States Postal Service "Priority Mail" cardboard box is against federal law. Gary Adler said he was just recycling a box that was going to be thrown in the trash, but the Postal Service said that kind of repurposing is illegal. Adler uses the boxes to mail sports memorabilia for his nonprofit organization Pro-Players Association. "We recycle old boxes that we get at the grocery store or from other merchants, and Dumpster dive sometimes," said Adler. Sometimes, Adler used the "Priority Mail" boxes that were left in the trash near the P.O. boxes. "We took off the tape and we took off the old label that was on there originally," said Adler, describing a box he recently sent that was returned by the Postal Service. "And we re-taped this box that was originally this way and we made it this way," showing how he turned the box inside-out so it's brown on the outside and not white. But the Postal Service said what Adler did is against postal regulations. He is being warned not to do it again, but if he continues to reuse "Priority Mail" boxes, he could be charged with misuse of postal property. "Our Priority Mail and Express Mail boxes are, bottom line, supposed to be used for that service," said Nicole Reiter with the Postal Service. "That is what they are intended to be used for." The Postal Service said it promotes recycling, as long as customers pay accordingly, even if the box is turned inside out. 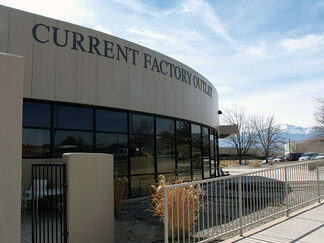 "It is important that the customer uses it for the proper service," said Reiter. Reiter said customers sometimes order their priority and express mail boxes online and then try to use them standard mail. She said that makes it difficult for the USPS to determine which boxes are new or reused. "I think it is stupid. Tentatively, this box was on its way to the Dumpster at the post office," said Adler. "Here, the post office is saying you can't use our boxes for recycling, go find something else." The U.S. Post Office refused to accept Adler's recycled "Priority Mail" boxes. Adler said because of this incident he will no longer use the U.S. Postal Service to mail his packages. Reiter said the boxes are a cost to the Postal Service and it supplies them for free to customers who pay for priority or express mail. She said enforcing the no-recycling rule would keeps postal rates low for everyone. Copyright 2008 by TheDenverChannel.com. All rights reserved. This material may not be published, broadcast, rewritten or redistributed.